"We bought water front property," she said. "When we can't use what we purchased, it is an issue." They have invested in a dock and water crafts but the silt build up is so bad on certain days that the creek becomes a sandbar. "To see a manatee stuck out there, flopping around," said Rick Karstedt. "It is hurtful to see." 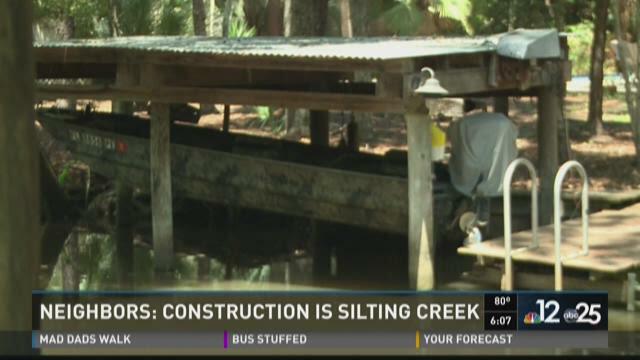 The St. Johns River Water Management District has heard their concerns. "We found the contractor violated water quality standards," said David Miracle. "We have issued a violation and we are meeting weekly until they can get the situation stabilized." "This is an embarrassment to the city," said Karstedt. Their district councilman, Matt Schellenberg, said he is aware of the violation. "I have engaged out general counsel to look into our next step," said Schellenberg. Where does it go from there, what does it mean? "Given a little more time I think we can solve the problem, " said Schellenberg. Residents say the solution is simple, remove the dirt. "Take your dirt back, we don't need anything else," said Roslyn Karstedt. The regulatory agencies all agree that Deep Bottom Creek is in need of restoration, but no one could say when or how. "To allow this to happen is certainly a crime," said Karstedt.